TeslaTesla’s Autopilot is not capable of fully autonomous driving. A Tesla owner was pulled over for using his phone and sticking his feet out of the window while driving his Model S with Autopilot activated, but he didn’t get a ticket, according to Jalopnik. A spokesperson for the Los Angeles court system told Jalopnik that the ticket was dismissed because the police office who issued it didn’t attend the hearing. The driver, Joseph Salim Mourad (who makes music under the name Klypso), had turned on the vehicle’s Autopilot feature while driving in Los Angeles and, at one point, was filming himself with his feet out of the window and his hands off the steering wheel. Mourad was later pulled over and given a ticket for driving too fast and using his cell phone while driving, but the ticket was later dismissed after Mourad contested it in court. Mourad told The Blast that he avoided paying the ticket because he presented evidence that the Autopilot feature can drive a Tesla vehicle autonomously, but a spokesperson for the Los Angeles court system told Jalopnik that the ticket was dismissed because the police officer who issued it didn’t attend the hearing. 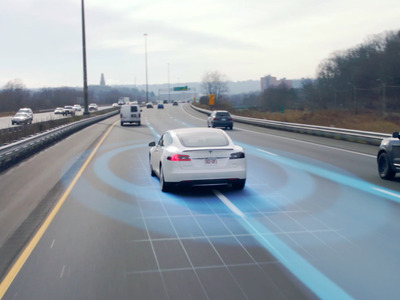 High-profile accidents involving Autopilot have revealed the difficulties automakers face as they introduce semi-autonomous technologies that can assume control in limited contexts, but are not yet capable of fully autonomous driving. While Tesla and other car companies insist that drivers should be alert and ready to take control at a moment’s notice, some drivers don’t follow that advice.